San Francisco’s Cell Phone Radiation Law: Fear or Science? San Francisco’s cell phone radiation signage law has passed, ready to scare and confuse consumers about the so-called dangers of phones. Why is it confusing? Because there’s no scientific consensus that a problem even exists. As the The New York Times report about the new law notes, it’s being heralded as a victory for the consumer by politicians including mayor Gavin Newsom. The actual requirement is that retailers must display a note next to the sales detail of every phone (in a font of at least 11 points high) that describes the specific absorption rate–SAR–of the device. Backers of the legislation see this as a great thing, as it’ll inform consumers of the “risks” of using a particular phone, in the same way that warning labels on cigarettes or foods work. intensity, big or small, causes harm to humans. What’s more, the average member of the public won’t know what SAR figures mean, and just sees a number that somehow relates to health and danger: Explaining that it’s a measure of electromagnetic radiation power absorbed per kilo of body tissue is beyond the purview of a tiny sign in a store display. Let’s look at what we do know. The most recent large-scale study, dubbed Interphone, which hit the news just last month, was based on long-term usage studies in several nations. While it found a correlation between elevated cell phone usage and certain types of brain cancer, there was no causal link established–meaning that other aspects of the lifestyle of the patients may also be the root cause. And another study, published in January, actually found a positive link between cell phone radiation and improvements in the brain function of mice suffering from Alzheimer’s disease. Meanwhile, a different study that hit the news two years ago suggested that cell phone radiation may adversely affect sleep patterns. This lack of consensus is what permits the San Francisco law to exist. 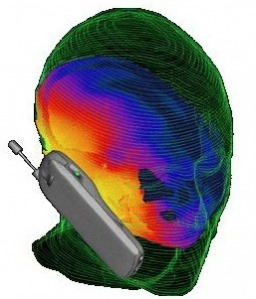 It also lets companies sell devices like the WaveShield, which notionally protects “your family” from the radio waves emanating from your phone by somehow diverting them away from your head “without affecting the call quality”–the scientific explanation for this mechanism is unclear. The best description of the situation is perhaps this meaningful quote from an episode of This American Life given by neuroscientist Leif Salford: “This is really the largest biological experiment ever, because we don’t know what the long-term effects are going to be” from extended cell phone use by so many people around the world. The conspiratorially minded among you might wonder whether the scientific study confusion is being sown by people with a stake in the outcome–that is to say, cell phone manufacturers. And given the possibility that there is a danger from cell phone radiation, you may as well use speaker phone or a headset when making calls. But the new labeling law relates to a perceived danger that is scientifically unsubstantiated, and instead is founded more on fear (or perhaps fear of litigation). Will it help consumers in any way? Probably not. And cell phone manufacturers are sure to mount a challenge to the law as misrepresenting their products.